With the semester ending and the summer on full kick-start, to students that usually means rewarding themselves with never-ending concerts, festivals, having a rad time with friends and being with family. Fortunately, I’m blessed enough to go back to my roots and explore Northern Virginia. The area in my opinion is the perfect location. You can get both the quiet subtle country style living while getting a dose of a metropolitan rush without it being too congested like the more popular cities such as New York or Los Angeles. Besides it being the country’s capital, it seems to be a very under appreciated and overlooked city so it doesn’t surprise me that it factors in the music. DMV (D.C., Maryland, Virginia) has been a very popular term in hip-hop addressing a specific region in the East Coast that does not see much musical spotlight, but I believe that’s coming to an end. Adventuring in DMV for the very first time as a 21-year old music nerd/junkie, I was able to travel with my cousins and attend different venues and concert halls to get a real feel of what D.C. is breathing as far as music. It only made me more proud of where I came from and I realized the state for lovers may also be the state for the best kept secrets in rap. On March 27, I saw Hudson Mohawke (famous electronic music producer signed to Kanye West’s G.O.O.D. Music label, if you didn’t know) DJ at U Street Music Hall, a popular venue in D.C. 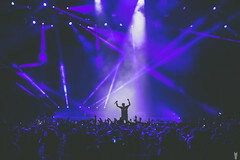 Although he did not play much hip-hop, when he did he was bigging up one of hip-hop’s premier artists from Virginia Beach, Pusha T, of famed duo Clipse. Push has been in the game for 10 plus years, but is now getting his just due as a solo artist. While the other half of the Clipse and old brother Malice found religion, it seems Pusha T found beats, great ones at that. At the show, Hudson threw on “Machine Gun” by drum and base group Chase & Status, which features Push. 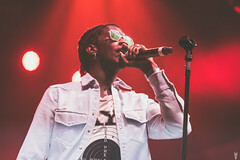 Not only does this track show the beauty of how hip-hop can mesh with other genres, but proved how Pusha can vocally tear any beat. The rapper’s annunciation in his syllables acts as an additional drum as he rhymes over the beat. 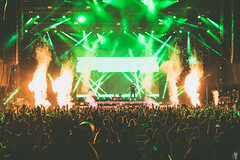 The production is very grimy, hard-hitting and is the opposite of the typical hands-in-the-air-look-I-have-glow-sticks EDM song you’d hear at a local nightclub. It’s the perfect marriage between Pusha’s in-your-face rap delivery and his subject matter is nothing less than the egotistically d-boy lines that comes off as beautifully brash with neck-breaking production. Fresh off signing with Rick Ross’s Maybach Music Group, Fat Trel from the Slutty Boyz is gunnin’ straight out of D.C. and is letting people know he’s going to be a problem for these other rappers in the game. As soon as Trel got the MMG spotlight on him, it’s like he’s been flooring it 120 mph with features and leaking songs before the ink dried on his contract. This song from his latest mixtape Gleesh, also features fellow label mate and D.C. native, Wale. My favorite element of this song is the beat by No Credit. It is nothing I ever heard before even though it is very simple, quirky and catchy. With the instrumental being as repetitive as it is, I think Trel and Folarin both knew they needed to compliment the beat by making their bars entertaining, which they perfectly did without overdoing anything. Both Virginia MC’s flex the in-and-out flow by rapping four bars each before passing off the mic like old Run-DMC style. This unorthodox style record bragging about their expensive and lavish lifestyle not only showcases what tax bracket they may be in, but how a lyrically conscious rapper and a street shoot-you-in-the-face MC can put on for their city with style.